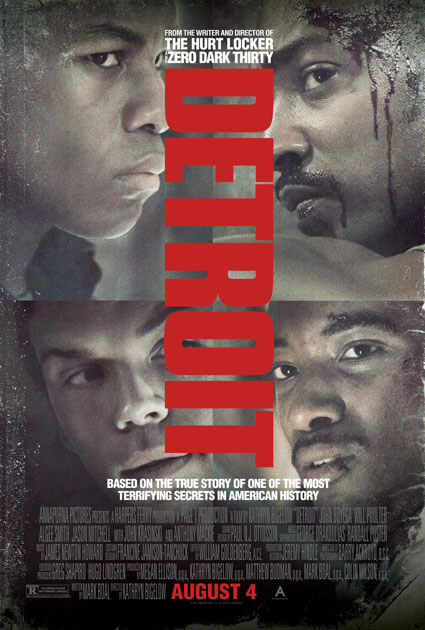 A new poster’s arrived for the dramatic film Detroit based on true events and directed by Kathryn Bigelow. The poster just unveiled by Annapurna Pictures features four of the film’s stars – John Boyega, Anthony Mackie, Will Poulter, and Algee Smith. The cast also includes Jacob Latimore, Jason Mitchell, Hannah Murray, Kaitlyn Dever, Jack Reynor, Ben O’Toole, Joseph David Jones, Ephraim Sykes, Leon Thomas III, Nathan Davis Jr., Peyton Alex Smith, Malcolm David Kelley, Gbenga Akinnabve, Chris Chalk, Jeremy Strong, Laz Alonzo, Austin Hebert, Miguel Pimentel, Kris Davis, and John Krasinski. Mark Boal wrote the script and produces with Kathryn Bigelow, Megan Ellison, Matthew Budman, and Colin Wilson. Detroit is set to open in theaters on August 4, 2017. The Plot: From the Academy Award winning director of The Hurt Locker and Zero Dark Thirty, Detroit tells the gripping story of one of the most terrifying moments during the civil unrest that rocked Detroit in the summer of ’67.